GMI Pro's ATA DJ Rack Case With Sliding Laptop Shelf is a top quality travel case that DJs and musicians can rely on for long lasting performance durability & style. GMI Pro's ATA DJ Rack Case With Laptop Shelf features a conveniently sliding track glide platform. The foam padded non-slip platform keeps your laptop in place during performances. The removable top & rear doors let you easily hook your equipment up, including CDJ equipment & DJ controllers. Protect your investment with confidence! GMI Pro, GMI Sound, Audio Dynamics and Feel The Music Inc. are a family of companies who have come together to provide the highest quality pro audio gear and equipment for the lowest cost possible. In business for 41 years, we are perfectly in tune with our global customer base of musicians, DJ's and industry professionals who turn to us for all their shopping needs. Come aboard, join our family, and feel the music! HOLDS DJ EQUIPMENT & LAPTOP: This case is designed to help you access & use your equipment. It comfortably holds CDJ equipment, DJ controllers features a sliding laptop stand. MEETS AIR TRANSPORT STANDARDS: This great rack case conforms to the Air Transport Association's requirements for a case of that size and type, so you can rest easy on your flight. 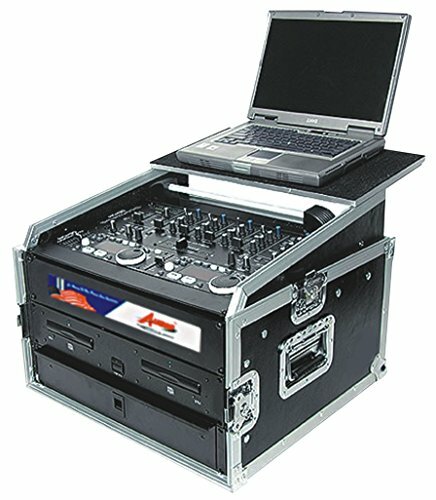 RECESSED HANDLES: Our professional DJ rack case comes with recessed handles, which are sturdy, won't break under the pressure of heavy equipment & won't take up extra space. REMOVABLE TOP & REAR DOORS: The removable top & rear doors are easy to fasten and remove so you can easily hook your equipment up and use it without removing it from the case. GREAT FOR MOBILE DJ'S & MUSICIANS: GMI Pro's DJ Rack Travel Case is an essential item for performance venues & mobile DJs who transport their own equipment, especially for flights. If you have any questions about this product by GMI-Pro, contact us by completing and submitting the form below. If you are looking for a specif part number, please include it with your message.